After several years scraping by as an actor in Vancouver, Canada, Ryan Reynolds and a friend (actor Chris Martin, not the lead singer from Coldplay) packed up and moved to L.A. They drove down Interstate-5, checked into a crappy, roach-filled Los Angeles hotel, and while they were carrying their bags in, his Jeep was stolen and stripped -- the stereo and even the doors were stolen. When they got the car back they couldn't afford to replace the stolen equipment, so for months they motored to L.A. auditions in a Jeep with no doors. 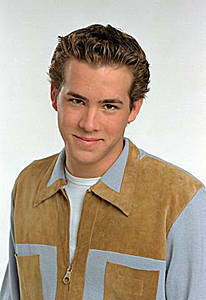 Ryan Reynolds played the hard-partying title role in National Lampoon's Van Wilder, but initially told the producers he was not interested. When they later brought him a rewritten script, he thought it was "a Ferris Bueller for the 21st century." Reynolds played another foul-mouthed wisecracker in Blade Trinity, and starred in the 2005 remake of The Amityville Horror. On TV, he had a featured role in the early-1990s Nickelodeon soap opera for teens Fifteen, and he later starred in the sitcom Two Guys, a Girl and a Pizza Place (retooled as Two Guys and a Girl). Apparently, Reynolds somehow had the notion that his sitcom Two Guys and a Girl was based on a real pizza parlor. It wasn't, but on a 2002 trip to Boston promoting Van Wilder, he drove around the city trying to find his fictional TV restaurant. School of Life (19-Feb-2005) · Mr. D.